Is this your year to let things come to you? Perhaps that sounds a bit passive. But as I’ve been pondering this lately I’ve come to the conclusion that letting things come to you is far from passive. It’s not exactly active either, at least not in the sense that we usually experience forward movement. When you let things come to you, you traverse the space between being and doing. Certainly, you do experience movement when you let things come to you. Yet it’s more like the meandering progress of a journey rather than the deliberate pushing forward to a specific destination. You practice sitting with the comfortable discomfort of waiting rather than forcing, resting rather than urgency. At least, this is what I believe, as I begin to turn toward the wisdom of letting things come to me. 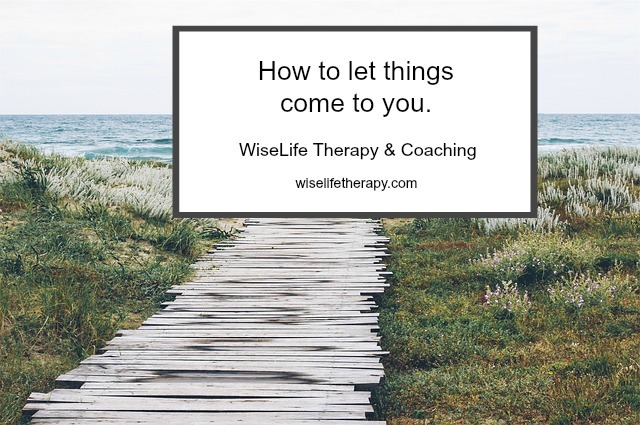 So, why would you want to practice letting things come to you? Well, think about it. How would it feel to be able to wait patiently to be chosen, rather than bearing the weight of decision fatigue? Imagine being sought, rather than constantly seeking. Or trusting, rather than having to pursue vigorously. And then, letting yourself turn toward, so things can come to you. In my own journey and in my work with women, the thought of letting things come to you is both tremendously compelling and slightly unnerving. So many of us have such a deep yearning to loosen the reins and step back. To retreat from the constant pressure to do more and be more. Not to mention the unending list of tasks to be completed. How do you step back, stop reaching so hard, and let things come to you? Of course, you don’t have to do all of these things at once! In fact, I could write a blog post about every single one of them. For now, though, maybe it’s best to start with the last one on the list. Yes, perhaps letting things come to you begins with keeping your promises to yourself. By this I don’t mean the big promises we’re endlessly encouraged to make in January. You know, the resolutions, goals, intentions. What I’m talking about are the dozens of small, sometimes tiny, promises we quietly whisper to ourselves that often go unmet. Like the pause at sunset. The nap on a rainy afternoon. Really looking into someone’s eyes. Running our fingers through the rosemary. Lighting a candle just because. I suspect you know exactly what I’m talking about because you likely have your own tiny promises. And you probably know that we women are usually really good at keeping our promises to others, but not always to ourselves. So this is what I wish for all of us in 2019. The kind of promise-keeping that cracks open the door to letting things come to us. And I’m giving the last word over to poet Christine Valters Paintner, who says it far better than I ever could.